CAREER HIGHLIGHTS: Ziebart joined Jaguar Land Rover as engineering director in 2013 as the automaker was expanding its product lineup and moving into electric drivetrains. 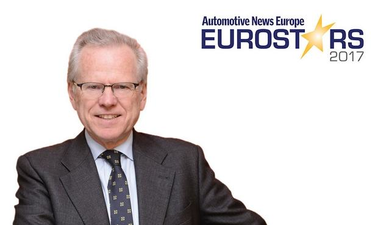 He started his career with BMW in 1977, rising to become head of r&d and purchasing. He has also served as Continental's deputy chairman and Infineon's chairman. Ziebart stepped down as JLR's engineering chief in 2015 but continued in an advisory role until retiring earlier this year. REASON FOR WINNING: With the Jaguar I-Pace, Ziebart successfully accelerated Jaguar Land Rover's shift toward electrification. Instead of electrifying a vehicle that started life with an internal combustion engine, Ziebart and his team developed the I-Pace's architecture around its electric powertrain. The car's hood became shorter without the need to house an engine and the wheelbase is unusually long, giving the car as much interior room as a BMW 7 series. The I-Pace has 400 hp and a 500 km-plus range.